Right first things first. We will have a full 60 items for sale on our 'in stock' page to be found here http://www.todsstuff.co.uk/in-stock/tods-in-stock.htm . This includes some hammers, eating knives, daggers and cooks knives. Secondly. I make no secret of how important I have found myArmoury and its community to my development as a maker of medieval weapons and simply put I think it is enormous. 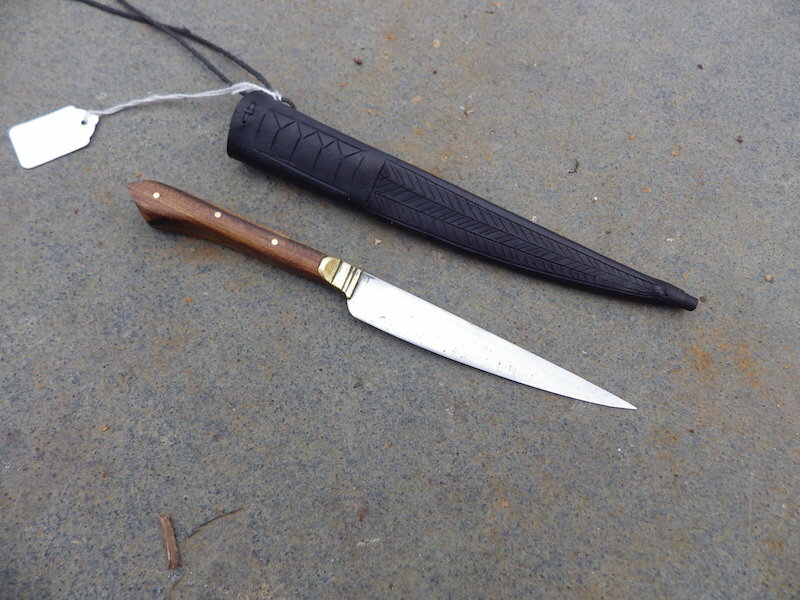 I cannot actually pay 'enormous' back, but I can give the fundraiser some money and have, but the sum raised was not so great this year, so I have decided to auction a knife for the fundraiser as well. 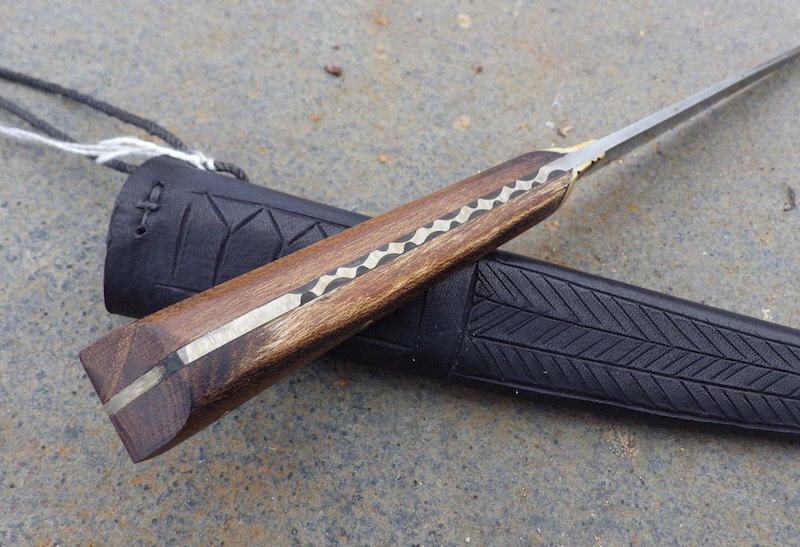 So from right now until I get back from a dinner party tomorrow night (probably slightly tipsy) at around midnight GMT, the knife below is going to auction. The starting bid is $5 and it would be nice if it sold for more than this, and what you bid as the winner will be what it costs, including shipping, to get it to your front door. Whatever the selling price is, I will deduct postage and the rest I will donate to myArmoury - this will all be public and shown on this thread. To bid, just say your price in the thread. This is a simple 14th/15thC style eating knife with sheet brass bolsters, laburnum handle scales, some file work to the spine and a brass inlaid makers mark. 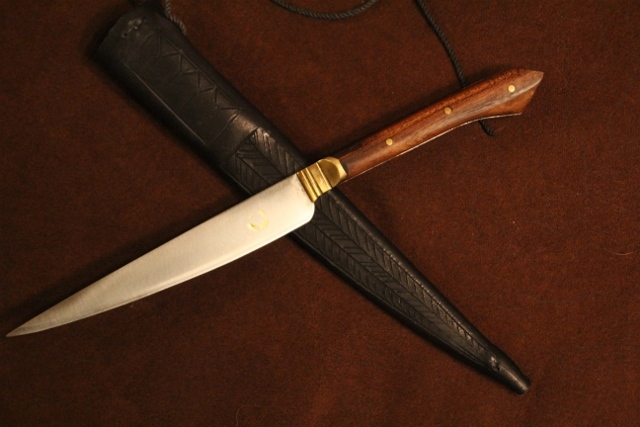 The blade is EN45 (0.7% carbon spring steel). 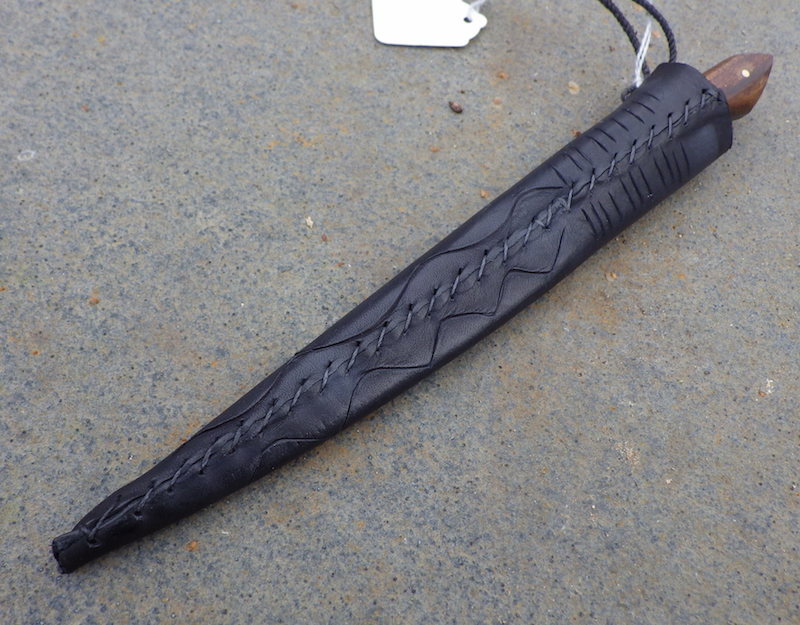 The sheath is made in 2 layers of veg tan leather and dyed black and has incised decoration front and back. ps. thanks very much for years of posting your stuff here! Lovely knife and great idea. I'll bid 100 USD. Appreciate all your fine works Tod, I've really enjoyed seeing it all here. That is a very generous start - thank you and it has been a pleasure being able to show my work. Looks like someone's already beat me to both the Burgundian Rondel (21) and the bronze bollock (45). Drat! You had me excited for a moment. Thank you for the fundraising efforts, Tod! I truly appreciate it. As far as the in-stock Black Friday stuff... there's so many things there that I'd be tempted to get if I could. The trefoil Landsknecht dagger is first on the list. Then there's thebronze hilted Landsknecht dagger, 15thC studded rondel dagger, circa 1500 bronze and horn hilted dagger, Dudgeon dagger, Burgundian rondel dagger... okay, wait, the list has to stop. I guess I'm saying I just really like what I see. Happily, the 15th century engraved bollock is now mine. $100 bid, less $16 shipping, so $84 will be on the way to MA when we get it all sorted out. Congratulations on your good taste in arms. In any case thanks to Leo for the generous idea to raise some more funds for the site, and it puts him at the very top of my list as the first site to look at when I want to buy something. Well I didn't mean to stamp the auction like that but I was excited for the idea. 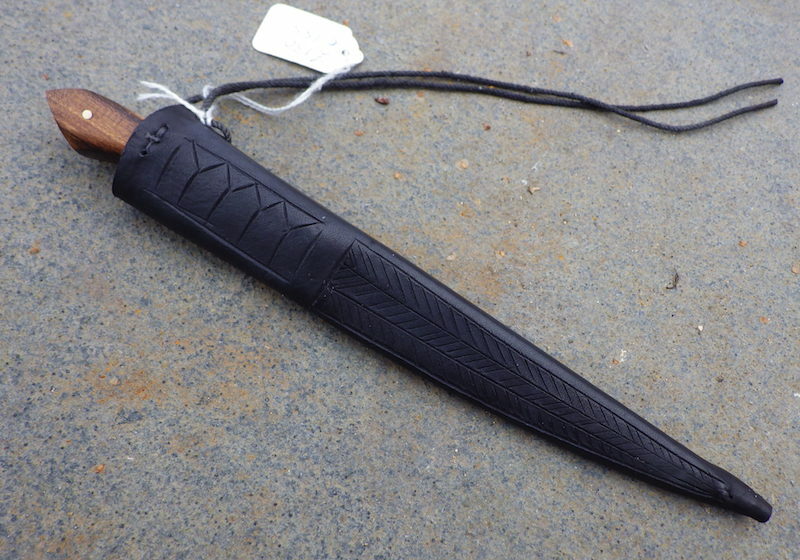 Now I'm quite excited for the knife, it looks like a very splendid piece and I'm pleased to have it! Thanks again. Thanks. It was a toss up for me between the bollock and the Burgundian Rondel. Someone beat me to the latter, so that eased the debate. My wife is being a hard taskmaster and withholding it until Christmas. Thanks everyone and quite a few pieces have gone and new ones have been added and Lou was up crazy late sorting through all that, so it seems a shame to stop the sale now, so we have extended until Sunday night. So, I got the dagger this weekend, and am really pleased with it! 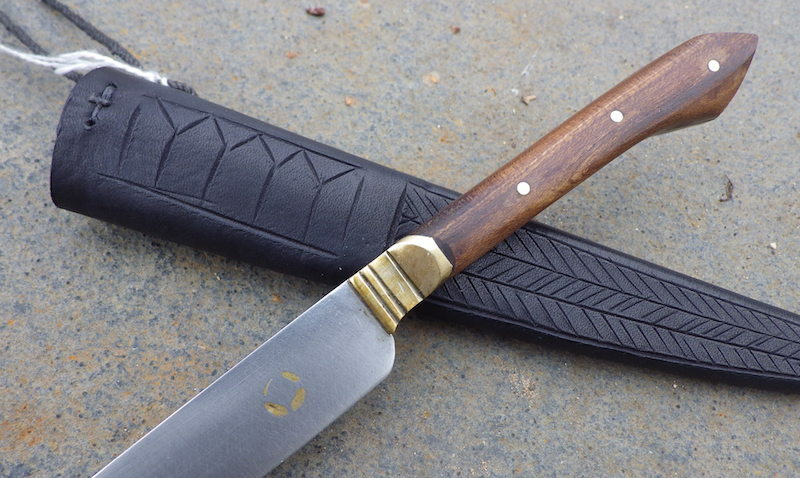 For a small knife, it really has some excellent touches like the brass bolster, the grip swell, and the file work on the spine. Really great job Tod, thanks for this opportunity, I feel very lucky! Thanks again Nathan for the great site! I am very glad you like it and it is good that it went to a good home in a good cause.